Ever since the Titans first appeared in her Detroit neighborhood, Astrid Sullivan’s world has revolved around the mechanical horses. She and her best friend have spent countless hours watching them and their jockeys practice on the track. It’s not just the thrill of the race. It’s the engineering of the horses and the way they’re programmed to seem so lifelike. The Titans are everything that fascinates Astrid, and nothing she’ll ever touch. She hates them a little, too. Her dad lost everything betting on the Titans. And the races are a reminder of the gap between the rich jockeys who can afford the expensive machines to ride, and the working class friends and neighbors of Astrid’s who wager on them.But when Astrid’s offered a chance to enter an early model Titan in this year’s derby, well, she decides to risk it all. Because for a girl from the wrong side of the tracks, it’s more than a chance at fame or money. Betting on herself is the only way she can see to hang on to everyone in the world she cares about. Why does Victoria Scott books always hit me really hard in the feels? I haven't cried over a book in a long time, and during the last chapter of this book I had tears pouring down my face. This book is a MUST READ of 2016. Despite the fantasy aspect of the Titans (Mechanical horses! ), Victoria's novel is full of real world problems, a strong female friendship, and tons of girl power. I liked Astrid from page one. She is determined and fierce. She knows what she wants. After her grandfather gambled away all his money and then the house his family lived in away, Astrid's family has no choice but live in their car. After settling down again, Astrid's father looses his job that results in hardships for his family. Then matters get worse Astrid's father gambles the remaining of their money away in a Titans race. Now facing eviction Astrid doesn't know what to do. Her father and his pride refuses the thought of Astrid getting a job. I was easily able to relate to Astrid. Though my family isn't as unfortunate as Astrid's family, I understand her fear of loosing her home. It is a scary thought. But hope arises when the makers of the Titan races announce that one person will have the $50,000 entrance fee waived. By luck Astrid meets someone with an early version of a Titan and enters the race. The winner of the overall races receives an award of 2 million dollars and Astrid knows that is enough to save her house, and send her and her best friend to college. I never thought I was going to fall in love with a metal horse, but Padlock is different. Titans 3.0 don't have feelings. They are incapable because it wasn't programmed into them. But Titans 1.0 do. Padlock acted and behaved like a real horse, he was able to be afraid and show love to Astrid. He went even further at the races. Astrid doesn't trust anybody except her best friend. Its hard for her too. The people she trusted all her life made nothing but mistakes. Eventually she trusts Padlock, she jokes with and was generally a happier person around him. Padlock even had a little romance with the White Mare that lived in Barney's barn. I was routing for a horse romance. That is how much I loved Padlock. I can talk all day and night about how much I loved this book. I am still trying to put into words how it made feel. The ending left me content with how Astrid's life will be after everything is said and done. In my mind I can see where Scott can write a sequel to Titans but I won't be unhappy if it doesn't happen because I loved this book. 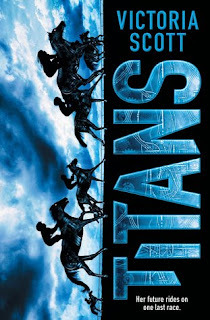 Titans is a book I will highly recommend to everyone and anyone who will listen to me. YAY! So happy to hear you loved this one! I'm even more excited about this one hearing about the strong female friendship! OMG I WAS ROOTING FOR SOME HORSEY LOVE TOO! Padlock and his grey mare... that was sooooo cute. I lived for those snippets in the book. ;D I already knew you loved this book and I'm so glad that you did! Your enthusiasm had me excited for it before I cracked it open. On to the next Scott book! Did you know that that you can make dollars by locking premium pages of your blog / website? Simply open an account with AdscendMedia and use their content locking widget.